This was a delicious fish crumble. 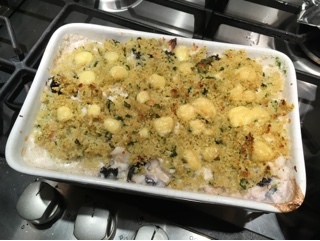 I loved the use of couscous rather than breadcrumbs or mash on top of this fish pie. It turned out delicious. Put the couscous into a bowl and cover with the just boiled water. Cover and leave the couscous to stand for 10 mins until all the water has been absorbed, then fluff it up with a fork. Put the onion and bay leaf in a saucepan with the peppercorns. Pour in the wine and milk, then stir in the creme fraiche. Put the pan over a low heat and whisk in the flour and cheese. When the sauce is well combined and the cheese has melted, leave to simmer gently for a couple of mins, then add the fish. Continue to simmer for 3-4 mins. Finely chop the parsley and set aside 2 tbsp. Stir the rest into the sauce. Spray an ovenproof dish with oil. Spoon the fish and sauce into the dish and season. Mix the rest of the parsley with the couscous and sprinkle over the sauce. Sprinkle the cheese in top, then drizzle over the oil. Bake the crumble for about 10 mins until golden and bubbling. Serve.